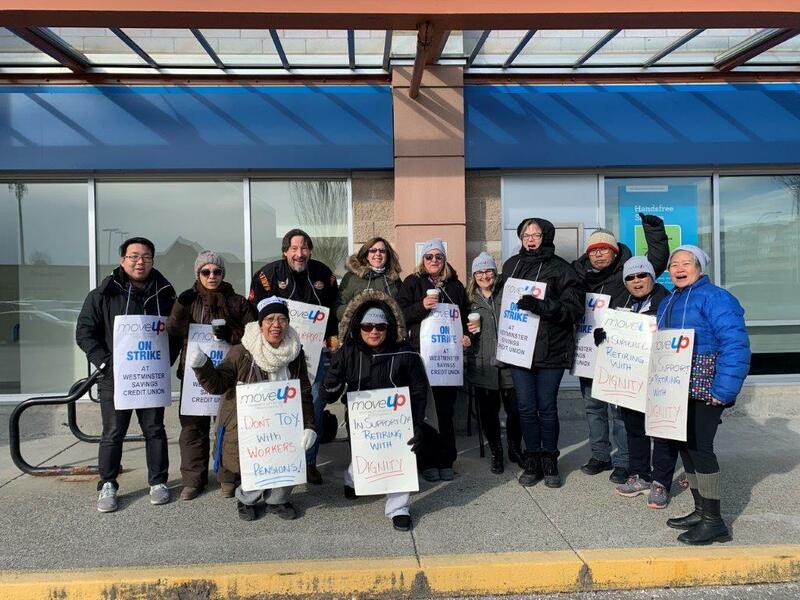 On Saturday, February 9, MoveUP members on the picket line at the Westminster Savings Credit Union Shaughnessy Station branch fighting for retirement security and against inequity in the workplace received a very special visit from members of the Vancouver Committee for Domestic Workers and Caregiver Rights (CDWCR). 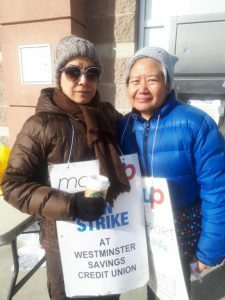 Among the supporters involved with the CDWCR is Cenen Bagon, a long-time dedicated MoveUP job steward and executive councillor and a human rights activist. Cenen was the recipient of MoveUP’s Ardell Brophy Award in 2018. Joining Cenen from the CDWCR visiting the picket line were Julie Destra, Lorina Serafico, and Lotis Ordonez. Established in 1992, the CDWCR is a community-based, non-profit organization that provides assistance to foreign domestic workers and caregivers in seeking improvements to their employment conditions and immigration status. We admire your courage of standing your ground despite your stagnant wages and benefits since December 2016 when your last bargaining agreement had expired. And then your bold decision to exercise your right to strike, the only tool where workers can show their collective power when employers do not negotiate fairly and honestly. We salute you for your sacrifices as we also know how difficult this strike action must have been costing you and your family. We thank you for showing other workers like us that fairness in the workplace and the dignity to stand up for the real value of our work are worth fighting for! We, from CDWCR, support your struggle.